“Abba Papa, You told me to bring every need and every concern to You. You’ve also reminded me that I sometimes don’t have the things I want because I haven’t ask You for them. My life is so full of so many miraculous blessings, but there are times when I dream of building a home with someone special. I would love to serve alongside someone who loves serving You. Conversations like this continued for the next couple of weeks, with the main thought of “Love You More” settling the discussion and flooding me with peace. He faced the beatings, the mocking, the cross, the separation, all because He loved me more than wanting His own way. For the next week, those words kept me company. Again, filling me with a beautiful peace and joy. This morning I was having one of those heavy days – a bit of angst and struggling. I asked the Lord if I could hear from Him in a special way. I spent time with Him in the Word, in prayer, and in journaling. It was a sweet time, but my heart was still struggling. I stopped by the Victory Home thrift store to pick up something for a friend. While there I wandered around a bit. A little black and white sign caught my eye. 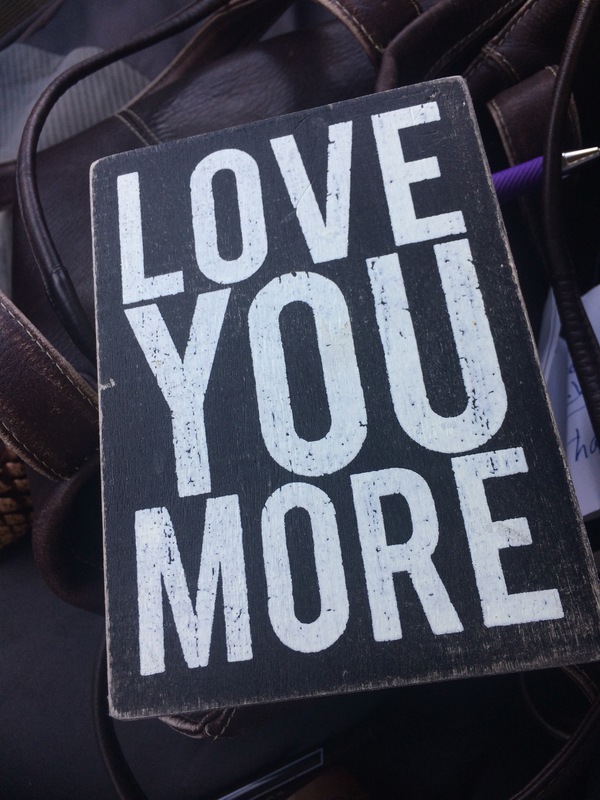 When I picked it up, it read, “Love you more.” That was my sign! God speaks my love language. He knew I needed an affirming word this morning. He even put it in writing so I would hear it loud and clear.